Saturday, Nov 3rd & Sunday, Nov 4th 2018 from 10-4 p.m. Wondering what to give this holiday season? Looking for something special for yourself? Give (or get) the gift of Alpaca! Browse through gorgeous sweaters for men and women, coats, capes, vests hats, scarves, gloves, socks, blankets, stuffed animals, toys, rugs, lotions, soaps, alpaca yarn and much more. Many new items! Remember … alpaca is finer and more durable than cashmere, lighter and warmer than wool and naturally hypoallergenic! refreshments and snacks while you shop. Bring your spouse or significant other, fill out a secret wish card and we will contact them with the gift information for you! 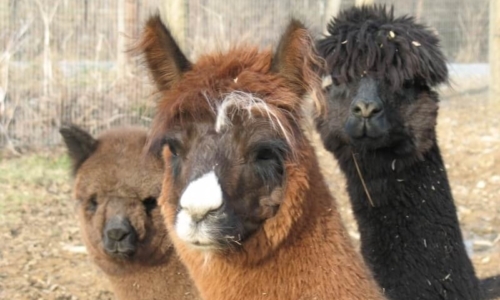 Stay up to date about our farm, our store, and our alpacas.